There was a slight error in the explanation of this change which we would like to now rectify. The IDFK restart ONLY applies in cases of a sending off (Red Card Offence, second caution included). The reason for this is that the player who is getting involved should be sent off, and not be on the field of play any longer. For that player to remain on the field because of an advantage, and then get involved with play again (when he should have been sent off) is unfair and not allowed. If there is a cautionable offense where an advantage is given, and the offending player in this case gets involved with play, the referee allows play to continue and must caution the player when the ball is next out of play. If you have any questions regarding this clarification, or any law change in general, please do not hesitate to contact us at info@torontosra.com and we will be happy to assist. Also, please check out our resources on the new 2016/17 changes – there’s lots of stuff there, including the OSA modules and clips with explanations. Denying an Obvious Goal Scoring Opportunity (DOGSO) as you know it has changed for 2017!!! This is the 2nd Education Session in the TSRA organized and hosted for the 2017 pre-season Referee Education Series. Referees must have a solid & up-to-date understanding of the laws and be able to quickly identify whether DOGSO has occurred or not. The New DOGSO will cover all the latest information and provide unique perspectives that are sure to help referees of all levels – this is a learning opportunity not to be missed! This referee education session is free and open to all referees of all levels. Attendance at this session also counts towards you receiving priority for referee assignments in the TSA. Time & Location: 7:00pm @ York Civic Centre, 2700 Eglinton Ave. West. We will have 2017 Membership Forms on-hand so you’ll be able to register or renew your membership for this year. Please bring your checkbook or cash. Receipts will be given. On our Education & Resources page you will find a wealth of presentations, clarifications and videos to help you get familiar with all the law changes that are in effect this year. Browse them at you leisure and be sure to take a quick look before any education sessions you might attend so you’re not left completely blind sided by some of the changes you will be required to adapt to. Rescue 7 – has an official charitable foundation – Chase McEachern Memorial Fund (CMMF) – Licence #765760897RR0001. Rescue 7 covers all expenses so 100% of all funds raised goes to deploying AEDs into charitable and not for profit organizations as well as families that are in need of one for a child and cannot afford them. 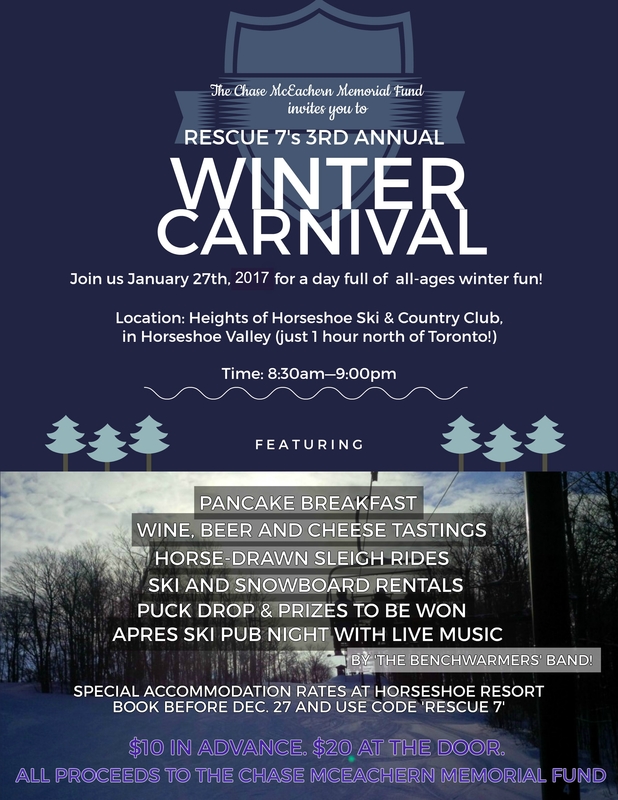 We are hosting our 3rd Annual Winter Carnival Day on January 27th. We have confirmed lots of activities for the day including Pancake Breakfast, Skiing, Horse Drawn Sleigh Rides, Puck Drop, Raffle, Silent Auction, Beer/Wine Tasting. Après Ski including Pub Night with a great band from 5 to 10 pm. Last year, we had 300 people attend the event and we are expecting even more this year and would love to see all of you there – families are more than welcomed including friends and neighbors. We also welcome all donations including monetary or prizes for our Raffle and/or Silent Auction. Please be sure to have your membership up to date so that you can vote!